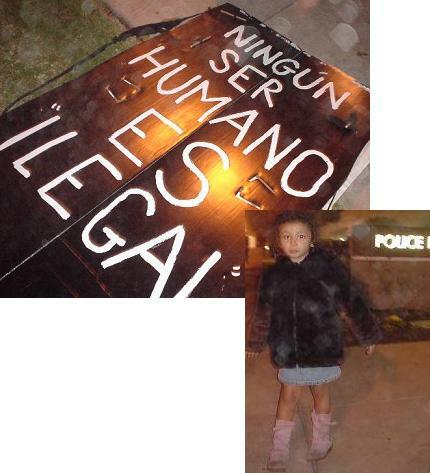 COSTA MESA, CA, December 23, 2005--Eighty people, calling Costa Mesa's Mayor Mansoor a racist and proclaiming "NingÃºn ser humano es ilegal," marched through Costa Mesa this afternoon in outrage at the city council's resolution to empower the city police department to check the immigration status of suspects. The city is the first in the country to commit its police to border control, and the demonstrators were determined to reverse that. Enveloped in the soltice darkness, we reached Fairview and Fall Drive, where the group broke into long chants of "The people united will never be defeated!" and "Â¡AquÃ­ estamos, y no nos vamos!" As the guitarists picked up the rhythm, the chants turned melodious as we approached the police station. We were met there by more protestors, and together we cheered on speakers as the police videotaped us and print journalists counted the crowd. Only a few of us recognized the four members of Save Our State, an anti-immigrant group which had promised a counterprotest, huddled by their pickup truck in the parking lot.